George Hampden Crosman was a career officer in the Regular Army of the United States who served primarily with the Quartermaster Corps. After graduating from the United States Military Academy at West Point in 1823, Crosman served at various army posts in the Midwestern United States during the 1820s and 1830s. 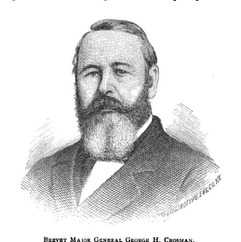 He was among the first army officers to propose the establishment of a U.S. Camel Corps to better transport supplies. As an officer in the Quartermaster Corps, he played a notable role in the Second Seminole War, the Mexican-American War and the American Civil War. During the Civil War, he rose to the rank of brevet major general and held a number of important posts in the Quartermaster Corps, most notably as quartermaster of the Schuylkill Arsenal in Philadelphia, the army's largest supply depot of that era.